Hypnic headache is a rare short-lasting headache occurring exclusively during sleep in the elderly population. First described in 1988 by Raskin, this headache syndrome was adopted by the International Classification of Headache Disorders in 2004 within the “other primary headache” group (code 4.5). Since then, additional case reports and case series were published and provided data to best understand hypnic headache. 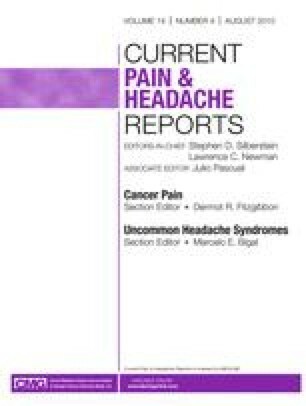 This review highlights new findings to discuss the relevance of actual diagnostic criteria and the treatment approach of this nocturnal headache syndrome. We also consider hypnic headache pathophysiology that remains speculative. Dr. Michel Lanteri-Minet has received personal compensation for activities (consulting clinical research) with Allergan, Almirall SAS, AstraZeneca Pharmaceuticals, GlaxoSmithKline, Grunenthal, Eli Lilly & Co., Johnson & Johnson, Medtronic, Menarini, Merck, Pierre Fabre, Pfizer, Sanofi-Aventis, UCB, and Zambon. Dr. Anne Donnet has received personal compensation for activities (consulting, clinical research) with Almirall SAS, Merck, and Pfizer.